Green and Mauve’s ventures into the quarry came to a temporary close this month after a mysterious turn of events. Ronez Quarry personnel phoned the team to report sightings of the pair in their machinery rooms at the bottom of the quarry. In itself, this was not unusual but, as it was during the day and the workers were testing out equipment, there were concerns for the birds’ safety. From the reports it seemed that the birds were actually quite calm, perched in the roof space watching the workers below. The real concern was raised when Mauve returned to the aviary minus her partner and minus her radio transmitter. It is not possible to say how she lost the transmitter. In flight it was clear to see she was missing the two central tail feathers that would have been attached to the transmitter and closer examination showed they had come straight out at the base rather than having snapped off. Maybe she got them caught or something tried to grab her by the tail. Other than the absent tail feathers she was in good health and her body weight was fine. Meanwhile, Green’s signal had not moved from the building. A site visit was arranged in the afternoon thanks to Ronez to see conditions inside the building and to try to locate Green. His signal was loud and clear but he was not visible. With a bit of detective work he was finally located outside the building on the lower bank. Mauve’s signal (from her missing transmitter) could not be picked up in the area or along the coast. A quarry worker reported seeing one of the choughs with missing tail feathers whilst in the building earlier so we assume she lost them in the quarry, and the transmitter has been broken or the signal is being blocked. When Green finally made an appearance he was looking a little subdued. Maybe confused as to where Mauve had gone and stressed at being by himself. Fortunately for him, Black was close by and excitedly calling for food when we appeared. This caught the attention of Green who flew closer to Black. After lots of frantic displaying/flirting by Black, Green joined her and then joined her in the supplementary feed. The next day saw both Green and Black appearing for food each time the we called them. Until that is they flew back to the aviary on their own accord at the end of the day. We tried to get them back inside the aviary, but the onset of thunder and lightning spooked the pair off the aviary roof and back to the safety of the quarry. In the morning, Green and Black were back at their normal spot in the quarry. 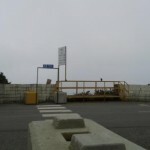 An all-day motocross event at Ronez Point, however, meant an alternative supplementary feeding site had to be found. Luckily with the team having access to the upper level of the quarry they could go in and approach from a different angle. Green was spooked by the use of the catapult, having never seen it before, and flew off across the quarry. Black followed but for some reason turned back halfway and returned to feed. Green continued to fly over the 4 X 4 race day going on at Sorel below him and on to the aviary. Green’s return was certainly welcomed by Mauve and the others, but the whole atmosphere seemed a little subdued. From observing him over the afternoon it was clear that he was not himself. His feathers on his front and the skin on his feet were grey and ‘muddy’. Presumably this was a result from being in the quarry buildings where rock dust settles in thick layers. Not having the ability to ask your ‘patient’ what the problem is makes it difficult to know how to treat. The additional problem is that any manhandling and catching of these choughs will stress them which may lead to negative associations. Much like dogs when they hear the v.e.t. word, we don’t want the choughs fearing the a.v.i.a.r.y. After a day in the aviary, Green’s feathers were clean but the feet were still grey. At training he was eating with the group when called although he wasn’t as quick to get to the food as the rest. This was put down to stress but with a mind that if things didn’t improve there might be an underlying health issue. Observations on the second day showed that he was not strong when flying and often couldn’t make it from one end of the tunnel to the other without losing height and landing on the netting or the ground. The decision was made to catch him up and upon weighing it was found that he was a good 30-40g underweight. This explained part of the weakness when flying. Looking at his feet it was clear that the grey was not washable, it was necrotic skin most likely a result of a chemical burn. He had also suffered a chest wound at some point as there was a large scab forming. Green was immediately put on a treatment of antibiotics to fight any infection. 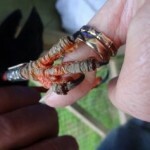 Medication is injected into insects which the chough will then eat. In order to ensure he would get exactly the right dose he had to be housed separate to the others for the duration of the course. He was locked into one of the sheds and given access to part of the poly-tunnel during the day. Faecal samples were submitted to Durrell’s lab including a group sample from the females. Although with no recent clinical signs, both samples tested positive for gapeworm. This parasite is not unusual in captive birds and can also be found in the natural environment. 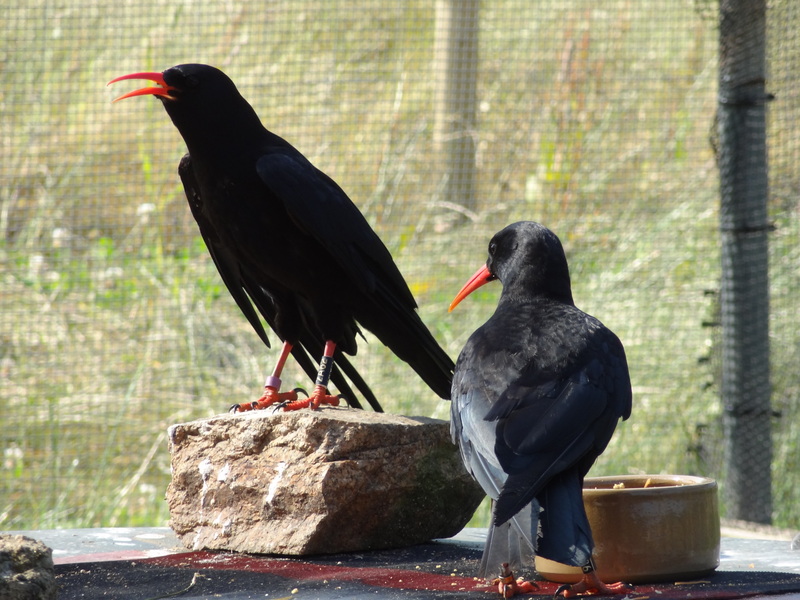 However, the situation the Sorel choughs are in will mean their stress levels are raised and are, consequently, more susceptible to the effects of gapeworm. All the choughs immediately started a two week course of ivermectin. Unfortunately this meant catching them up to inject them and repeating it two weeks later. In turn this meant no releases could happen until the medication was finished. Whilst this was going on Black made a surprising yet welcomed return to the aviary. She came back the day after Green had returned. In an attempt to coax her out of the quarry we had shifted the feeding site further west around the edge of the quarry. 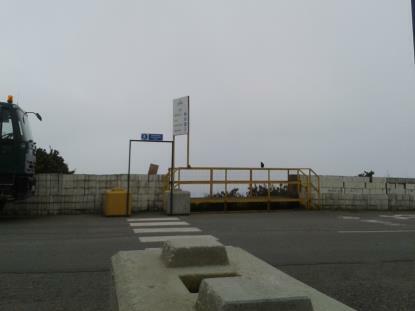 By the afternoon she had decided to return to the aviary taking a direct route along the cliff-path. Once again her body weight had changed little from when she first left. Since re-joining the other four choughs the group dynamics have subtly changed. Without anthropomorphising too much this is no doubt related to Green’s time spent with Black as well as the loss of Orange and White. 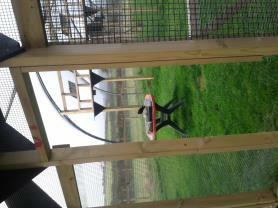 Immediately upon returning to the aviary Black stayed back from the group eating and preening and doing her own thing. Every now and then Mauve would leave Green’s side, fly at Black chasing her from her perch, then return right back to Green and preen him (a sign of pairing). With Green, now the only male, locked away, the competition for his attention has become a bit of a free-for-all. A veterinary check-up after Green’s medication ended showed that whilst his feet were healing there was still some way to go. 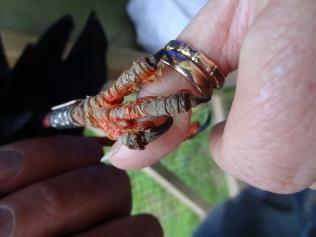 The most damage is around the ends of the digits leading to a small risk of losing one or two claws. A new discovery of a puncture wound on the right hock meant that the vet wanted to extend the antibiotic treatment. From assessing the scab and injury site this wound must too have occurred whilst out and about in the quarry. The next physical check-up for Green will be after the treatment has finished on 1st November. Until then he will be monitored continuously to watch how much he is eating and if he is in any discomfort. This month has seen changes afoot within the breeding pairs. Arthur has taken a fancy to the juvenile female who is now coming of age. This was somewhat predictable since Arthur and Guinevere didn’t progress past nest-building this season and failed to produce a clutch last year. ‘Gwinny’ is now perching and feeding with Tristan the male who we originally paired her with in 2010. The switch to Arthur came about when the two females fought over Tristan in 2012 and Gwinny lost out to Iseult. Keepers will be observing Iseult closely now as the breeding season approaches. Along with Tristan and Arthur there is a single juvenile male in the display aviary with a claim to stake. 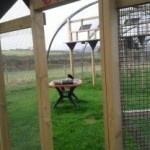 George, the hand-reared chough flown over in March to assist with the reintroduction, bid his farewells this month and returned to Paradise Park. With the breeding season approaching he needed to move out of the breeding aviary he was being held in. With no alternative and no possibility of using him at Sorel, Paradise Park were asked if they could take him back. George is quite the character and will be missed by all and no doubt there will be a few holidays booked to Cornwall in the near future! The Bird Department recently purchased new weighing scales, the same model as used at Sorel. The scales’ design makes it easier for certain species to walk or land on them. Bird staff have started training some of the captive choughs as in this way we can monitor weights and infer general body condition, without having to catch the individual and cause unnecessary stress. George was eager to show off his skills when it came to jumping on the scales. It will require a little more work with novices like Arthur and Gwinny. Earlier this year, Iona Mucherek-Parramore spent time on the Bird Department collecting data for her MSc in Endangered Species and Conservation. 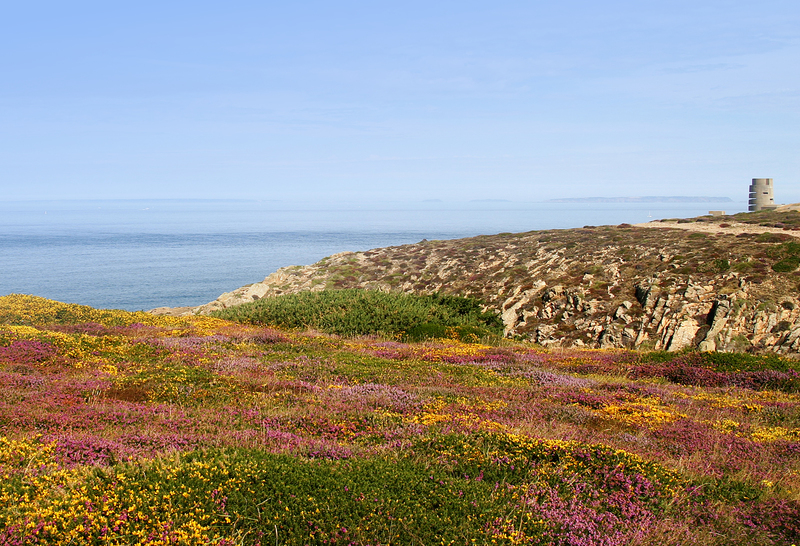 Durrell has developed a close relationship over the years with Nottingham Trent University who send students here for various degree programmes. Iona’s study was looking at the nutrient profile of the chough diets at Durrell and relating it to reproductive parameters. Choughs in captivity are provided with a breeding diet from January to August and then a general maintenance diet for the rest of the year. Birds require more protein in their diet during egg-production and chick-rearing. We cannot provide the diversity and quantity of insects choughs would need, so finely chopped ox heart is added in January to replicate this. 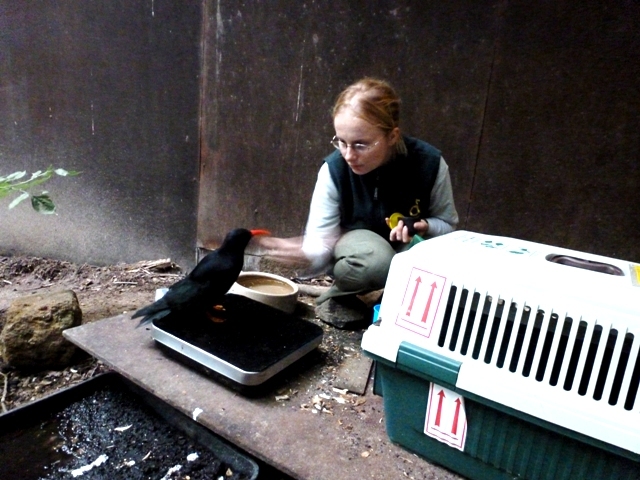 Iona spent eight days at Durrell collecting food samples and analysing reproductive data. On returning to Nottingham Trent she then had several weeks of lab analysis and the daunting task of dissertation writing. Her final thesis was submitted in October, a copy of which will be kept at Durrell. The analysis brought to light a few interesting points that need addressing before the next breeding season as they may be influencing egg productivity and survival rates. For example there appears to be no difference in calcium provision between the two diets. Extra calcium is added for the breeding season using grated cuttlefish bone. However, other ingredients are reduced which also contain calcium thereby negating the impact of the cuttlefish bone. Also, the fat content year-round is much higher than one would expect for birds. It should be noted though that there is no published data available for choughs to allow a definitive comparison.